Whether large or small, a successful marketing campaign follows the same path. Don’t always think of a campaign as something huge and daunting; a group of emails that you send out to your contact list over a month should also be considered a campaign. The biggest difference in the size of the campaign will be the resources expended—time and/or money—on each step. 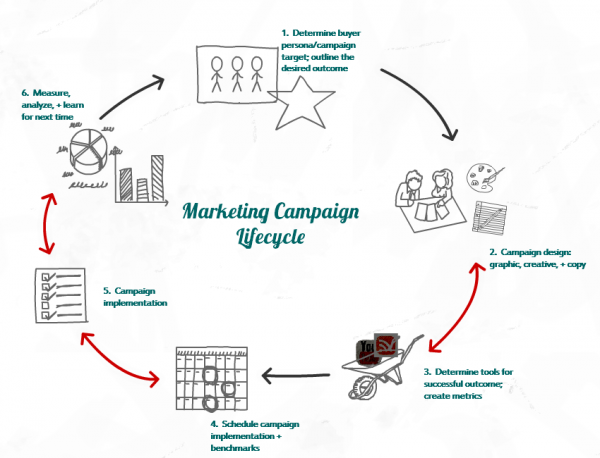 The lifecycle of a marketing campaign follows 6 basic steps. Determine your buyer persona/campaign target and outline the desired outcome. Likely, you will already have a good understanding of your buyer persona profile; this step in the cycle will identify which of those personas you are trying to reach. For example, your buyer personas may be both mothers of elementary schoolers and elementary school teachers, but in this particular campaign you’ve decided to target the mothers. Campaign design—graphic, creative, and copy. This is where you can get creative. Start your brainstorm with the sky as the limit; don’t get caught up in your resource limitations during your brainstorm because it will inhibit ideation. After brainstorming, you have to come back down to earth and figure out what your resources will allow. If you have no budget, you probably can’t hire M.C. Hammer (I heard he was busy with a new project too). Not every campaign has to be earth-shattering. Once you’ve developed the campaign outline, proceed to creating graphics and copy. Determine tools for a successful outcome. Go back to what you want to accomplish (step 1), your buyer (step 1), and your campaign (step 2). Often, steps 2 and 3 may be run concurrently. When determining the tools to use, consider your target audience’s sophistication (especially digitally), your resources, and a quick to market approach. 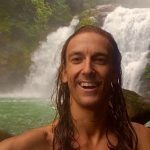 It’s better to use Facebook and your company blog if you already have both of those tools in place. Don’t build a brand new website until you gain traction on some smaller similar campaigns. After you’ve determined the tools to use, set your metrics. These will be ways that you can tell early and easily if the campaign is going in the right direction. This is not the end, but it is your campaign flight dashboard. While ultimately the number of new Facebook likes are not what you’re looking for, that may be a good metric to figure if you’re on the right track toward your destination. Schedule campaign implementation and benchmarks. Create your campaign calendar. If it’s a longer campaign (more than 4 weeks), set sprint benchmarks along the way. This will keep your team energized and moving. If the benchmarks are not met, it will also let you know if you’re on the wrong track. Put all dates and to-dos in your project management software (we use Basecamp) and include various members of your team. Implement the campaign. Surprisingly, this will be the easiest of the 6 steps. If you’ve planned appropriately, you know your target audience, and you know what to measure, step 5 will be a walk in the park. Most important in step 5 is to pair it with step 6 and to begin measuring and analyzing your campaign immediately. Especially if you’re running a digital marketing campaign, you will get an early read on the success and will know whether any tweaks need to be made. Measure, analyze, and learn for next time. Again, step 6 should walk hand-in-hand with step 5 as measurement along the way is imperative. Just because you’re heading for a mountain that you didn’t expect doesn’t mean that you should crash, burn, and start the next campaign. Make adjustments. At the end of the campaign, be sure to note everything that you learned and measure your final success against your original campaign goal. If you are traveling into uncharted territory—whether it be with different tools, a different audience, or a higher campaign spend than normal—we recommend starting with a mini-campaign to gauge interest and to better predict outcomes and successes. Don’t spend a bundle on premier videos until you’ve seen through a smaller campaign that your customer really digs the videos. Which part of the marketing campaign lifecycle do you think is most crucial? Alexandra Gibson is the Managing Director for OttoPilot Media, an inbound marketing firm based in Charlottesville, Virginia, and the SVP for Aspen Associates, an FF&E procurement company in the hospitality industry. She wrote her first business plan at age 11…she’s been entrepreneurially intolerable since then. Be sure to follow her on Twitter- @gibsondm.